I sound like such a broken record, but when the heck did it get to be August?!!!! I leave for Tigertown a week from tomorrow. As always, I'm recapping my month, but with a little twist because I'm also including what I intended to post on my birthday last week (oops). So this was definitely the biggest thing to happen this month, even if it did just happen at the end. I'm finally 21! I've always been the baby of all of my friends, so I feel like I'm finally caught up with the big kids. I celebrated my birthday at the beach with my family on the day, then my first barhopping experience with my best friends this past weekend. It was so much fun, especially going out with my friends since we will all be in different places this year. At the end of June, I finally got myself together and went to the new public library in my town to renew my library card and check out some books. Since then, I've been reading a ton! This month alone, I read American Wife by Curtis Sittenfield, The Last Anniversary and The Husband's Secret by Liane Moriarty, Whistlin' Dixie in a Nor'easter by Lisa Patton, and Red Queen by Victoria Aveyard. Our library has an app where you can check out e-books, so that's how I read Red Queen while I was on vacation - look into whether your library offers something similar. I liked everything I read, but Whistlin' Dixie in a Nor'easter was a definite favorite - check out the recommendation from Nell on Prep in Your Step. I also love a good Young Adult series, so Red Queen was another favorite - it has a lot of twists and turns and wasn't what I expected, I'm itching to start the next in the series. Now for the second part of this post, I intended to put it up on my birthday, but I was enjoying vacation. So better late than never, here are 21 facts about me. 1. I am the third of four siblings. My mom calls me her "well adjusted middle child," but I'm not entirely sure what that means. 2. I don't have a good reason for why I chose the college I did. Clemson just felt right in the end, so I acted on my gut feeling and haven't looked back. 3. Texas country music is the best music in the world and what I will choose to listen to above all else. (if you like country and are looking for something new, check out Aaron Watson, Casey Donahew, or Josh Abbott Band, they're my faves). 4. When I was in the fourth grade, I modeled in a magazine called Discovery Girls. Each month they chose a state and chose girls from that state to feature. We all met in Houston and got to spend a weekend shooting for the magazine, luckily those photos do no still exist online. 5. If I could live anywhere (besides TX, of course), I would live in Savannah, Georgia. It's the prettiest city I've ever been to. 6. I would love to adopt a child one day. 7. I'm extremely type A, but also a major procrastinator. I have a perfectly color coded agenda, but wait until the last second to cross of those to-dos. 8. If I had to read one book for the rest of my life, it would be Harry Potter and the Prisoner of Azkaban (the third). It's my favorite of the series, but I'm a huge Harry Potter nerd in general. 9. I would have been born on my grandma's birthday if it wasn't for Gloria Estafan. The doctor had tickets to her show on July 23rd and didn't want to miss it if I took too long. 10. I had my first job at 14 bussing tables at restaurant on the lake nearby. 11. I started this blog with the intention of it being a fashion blog, because I was so frustrated by other bloggers' opinion about what is "reasonably priced." I hope to eventually reach that goal. 12. While I went into college wanting to becoming a psychiatrist, I now plan to go into marketing research, but I never changed my major from psychology. 13. For the majority of my life, I was a cheerleader - either through competitive teams or school. I was even captain of my high school team my junior and senior years. 14. You've probably read about him on here before, but I have a wonderfully sweet boyfriend that I will have been dating for 3 years this November. 15. The most perfect meal, in my opinion, is a grilled cheese and tomato basil soup. 16. While I have grown to appreciate neutral colored clothing as I've gotten older, 9 times out of 10 I will choose to wear something bright colored over a neutral. 17. I have an obsession with all things pineapple - I love the fruit, but mostly my obsession is with pineapple decor or embellishments. I'm not sure where it came from but I don't think it's going anywhere anytime soon. I got a lamp with sequined pineapples on the shade (for my apartment) for my birthday. 18. I have an irrational nervousness (I wouldn't call it a fear) of people overhearing me talk on the phone. I won't have a long conversation with someone on the phone if there is someone else who may overhear, it feels like an invasion of privacy. 19. I'm extraordinarily fair skinned. It seems almost impossible for me to tan. I used to hate it, but it's grown on me as I've gotten older. If only I could find foundation the right shade. 20. I rarely go a day without wearing makeup, but only because I really enjoy applying makeup and it's a relaxing part of my morning routine. 21. I'm extremely introverted and shy to start off with, but once I get to know someone I can chatter on forever. So there you have it. Some of the highlights of my July and 21 facts about me! What were some of the favorite parts of your month? Happy birthday Ashley! Sounds like you had a fun one! It was cool learning more about you. I also don't have a good reason for why I choose the university I did. It just felt right and I acted upon that feeling. 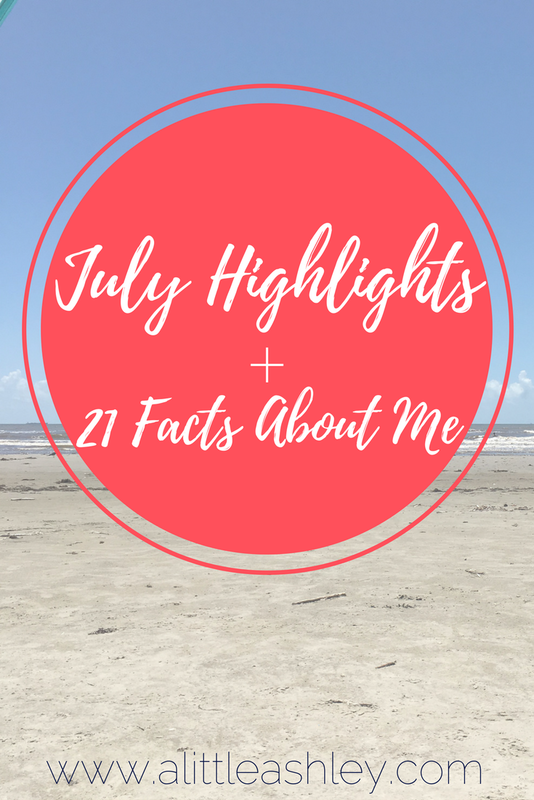 Can't wait to read your August highlights!